Three modules are available now: language and files support for X3DV, a palette of code for x3dv, and now, with this new version, it has also support for VRML. 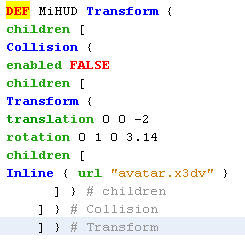 What are Netbeans and X3D? I have already explained what are VRML and X3D in a previous post. With them, you can create 3D virtual worlds. 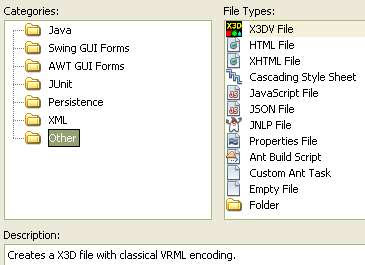 The Netbeans X3DV Module Suite is for editing X3D inside Netbeans, in classic VRML encoding (with .x3dv extension). The classic VRML encoding is very easy to read and understand. 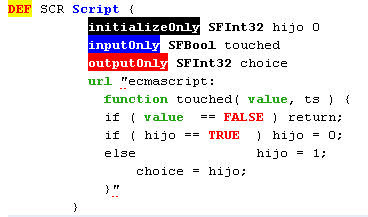 What is included in this module Suite? 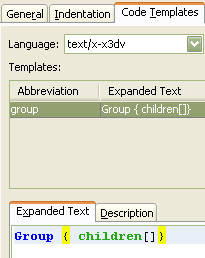 You can edit and create new X3DV files inside Netbeans. With the 2.0 version, you can also create and edit VRML world files. 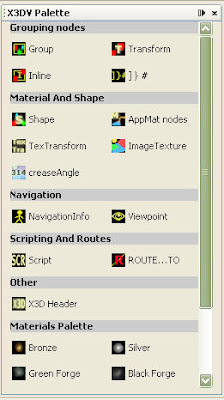 Icons for X3DV files and VRML files. 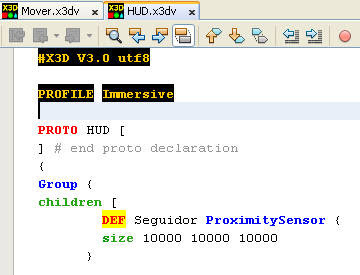 Added in the 2.0 version of the X3DV Module Suite. It has all the same features of the X3DV Encoding module, but for VRML. I decided to add this module because many people still use VRML today, or are migrating their files to X3D, so this tool is very useful for them. If you like this project and want it to continue growing, or if your business, project or 3d artwork uses it, consider making a donation. By donating to this project any quantity (from $5 to $250), even if it's small, you benefit yourself too. These founds will be used for the project growing and promotion, and also encourage further developing. 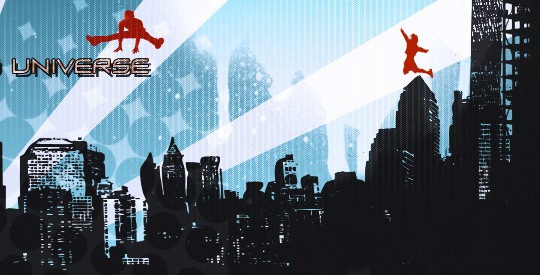 A 5% of the amount is given to SourceForge to help the community of free software developers. By donating through this button, your donation will be registered and eventually displayed in this projects donors. If you prefer to donate directly through PayPal, you can do it here. If you can't make a donation, another way of helping is voting it in any social bookmarking site you use, or simply voting it in the Netbeans Plugin Directory. To install it, you just need the main package, that is named "X3DV Module Suite v.2.0 Install". The other packages are thought for developers. If you are a developer, respect the LGPL license, and report any improvement you make to the modules. Download and install Netbeans IDE. You can use any Netbeans bundle. For example, the Java SE bundle, that can be used to program in Java, and is only 25 MB (or the PHP one, that is only 16 MB, or for C/C++, just 14 MB). Search the .nbm files of the Module Suite. Add them all, or those that you like, in any order. If you have any feature suggestion, wish list, idea or comment, please use this site and post to suggest it. There are many domain names to choose from when a webmaster decides upon hosting. One should always go for a deal compatible with ppc. Thank you , Jordi . "error ..solid of a Box has not to be true " ! Thanks for testing and for your comments. 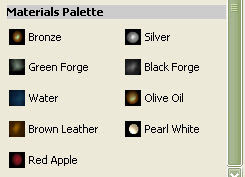 Remember that these plugins are not for .x3d files (x3d in xml format) but for .x3dv (x3d in classic vrml format). BSContact support for x3d is not too good. By the way, what an estrange error in BS Contact: "error ..solid of a Box has not to be true "
That's what I mean when I said that xj3d is the only viewer that gives understandable error messages.